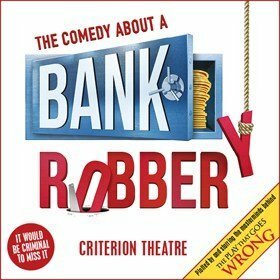 Written by and starring the Mischief Theatre Company who brought you the 2015 Olivier award-winning Best New Comedy “The Play That Goes Wrong” and “Peter Pan Goes Wrong”, book now, to be entertained by their unique brand of humour in this hilarious new show – The Comedy About a Bank Robbery. Directions from nearest tube: The theatre can be seen on Piccadilly Circus next to the Eros statue. In 1870 following the acquisition of the site of the 17th century White Bear Inn and adjoining properties between Jermyn Street and Piccadilly Circus (known as Regent Circus). Caterers Spiers and Pond commissioned Thomas Verity to design a development which would consist of a substantial restaurant, dining rooms, ballroom, and galleried concert hall. Having started building work it was decided to change the proposed concert hall, (though retaining the composers names which still line the tiled staircases to this day), to a theatre which opened on 21st March, 1874. The opening productions were An American Lady, written and performed by the manager Henry J Byron and a piece by W.S. Gilbert titled Topseyturveydom. Under the management of Charles Wyndham, The Criterion established itself as the leading comedy house in London. Between 1920 and 1940 productions included Musical Chairs with John Gielgud, and in 1936 a three year run of French Without Tears which founded the career of Terence Rattigan. During the Second World War The Criterion was taken over by the BBC. As an underground theatre it was suitable for light entertainment both recorded and live. Following the war, were productions such as Beckett’s Waiting for Godot and pieces by Anouilh, Dario Fo and others. In the 1970′s the Criterion Theatre site was proposed for redevelopment, which caused significant public protest as people feared the theatre would be gone forever. Throughout the 1970s and early 1980s the Equity Save London’s Theatre Committee organised demonstrations. Notable campaigners from the world of stage included John Gielgud, Diana Rigg, Edward Woodward, Robert Morley and Prunella Scales. Finally, the theatre’s future was secured, although subsequently the theatre closed for three years from 1989, until reopening in October 1992 while the Criterion block that stands today, was constructed around it. With significant refurbishment both backstage, and in the front of house, The Criterion Theatre has retained an almost perfectly preserved Victorian auditorium. From 1996 to 2005 The Reduced Shakespeare Company entranced audiences with their 30+ snippets from Shakespeare, even with one performance being performed backwards! The theatre retains its Victorian auditorium which ensures the Criterion retains an intimate and atmospheric presence for those on stage and in the audience. 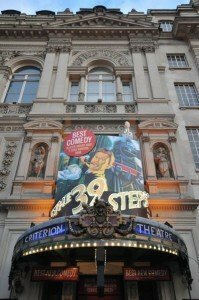 The 39 Steps closed on Saturday 5th September 2015.